Boston Dynamics’ scary-smart robots make use of sophisticated computer vision, but MIT is following a different strategy with its Cheetah 3 robot. The vision-free version of MIT’s 80-pound, Labrador-sized Cheetah 3 can find its way across a pitch-black room and up an obstacle-littered stairway without the use of cameras or environmental sensors. 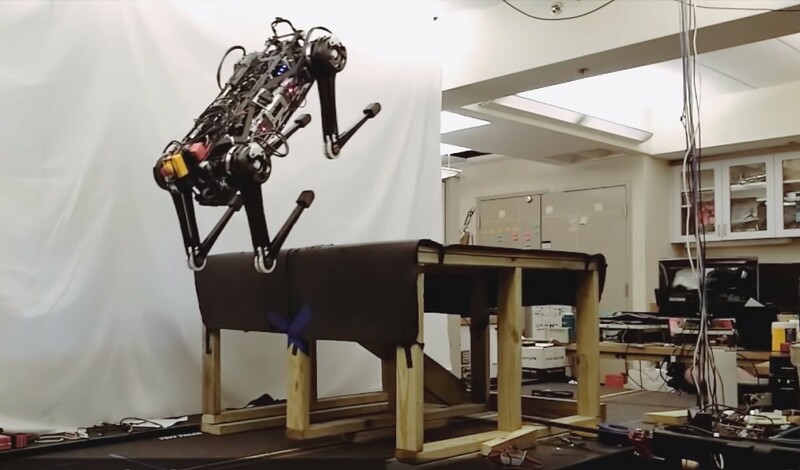 Instead, it relies on what engineers call “blind locomotion” — that is, the feedback from its robotic legs and its algorithm-based sense of balance as it scrambles through the dark. “There are many unexpected behaviors the robot should be able to handle without relying too much on vision,” designer Sangbae Kim, an associate professor of mechanical engineering at MIT, said today in a news release. The strategy is well-suited for getting around disaster zones or other risky environments. This entry was posted in GeekWire and tagged Bot or Not, MIT, Robots, Technology. Bookmark the permalink.